For a time I thought sharing recipes that most households already have in their normal rotation was kind of silly. But I then realized that I started this blog to share recipes in hopes that it would help someone get supper on the table without a lot of fuss. What may be simple for some, may not be for others. So I think it is a fine time to share how to make the perfect Southern Iced Tea. 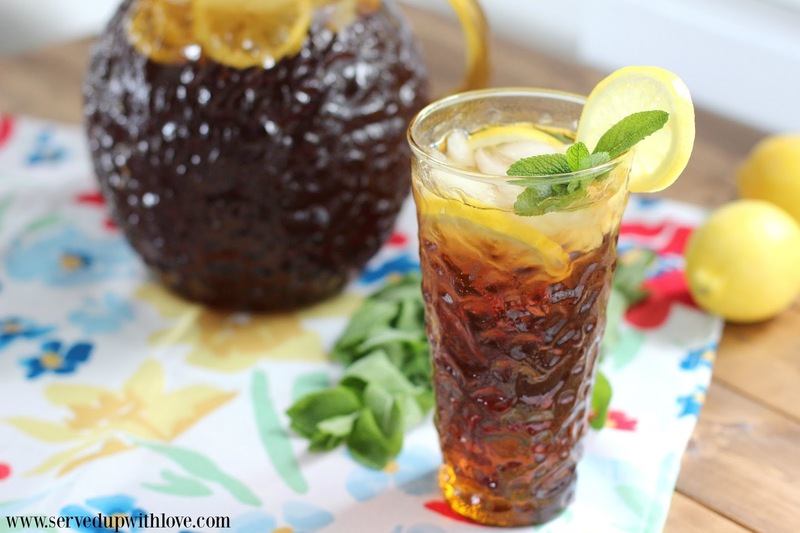 Making the perfect southern iced tea can be quite simple. However, if you were to ask all your family and friends how they make it, I bet you would get a different answer from each of them. Not only that, but each one would boast that theirs is the best iced tea around. 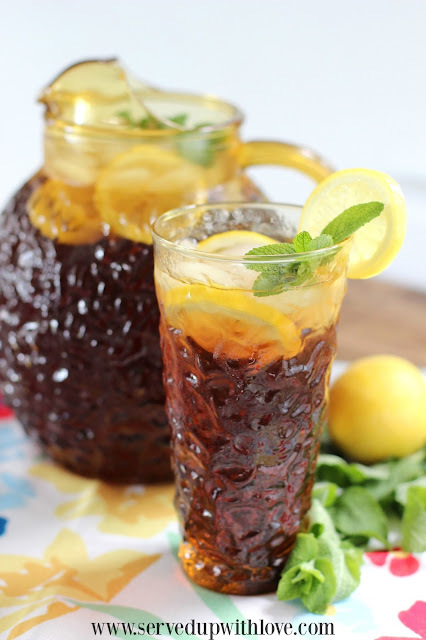 Like most southern households, we grew up with iced tea being our main beverage and readily available at every meal. So naturally, there is always a pitcher of tea in our refrigerator ready to quench your thirst any time of day and any time of year. 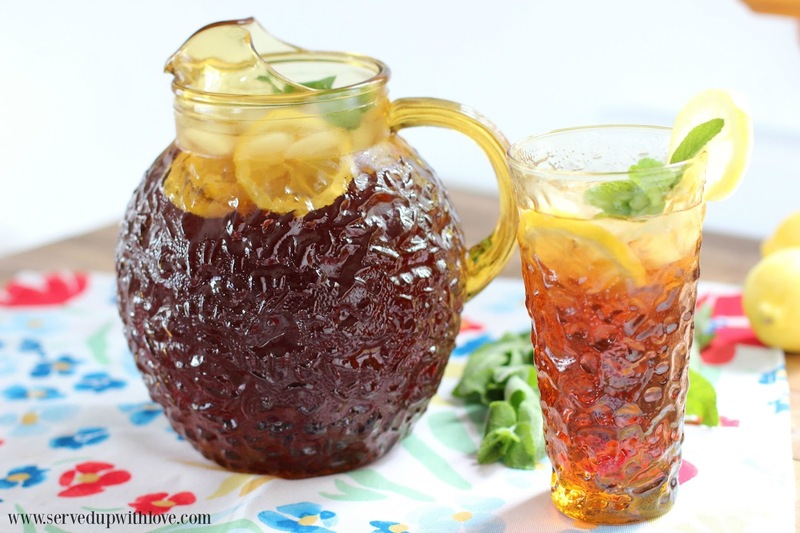 Sweet tea could be easily called the house wine of the South. 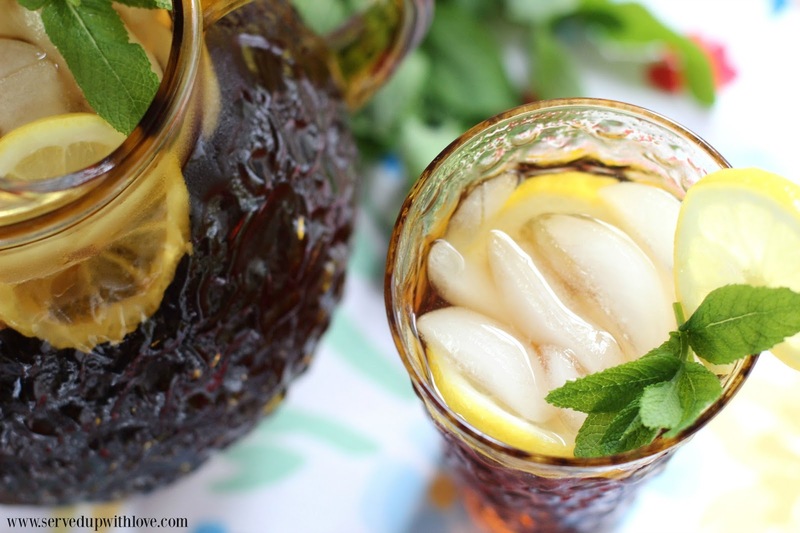 Almost every home has iced tea whenever you stop by for a visit. At church suppers, family meals, reunions, or any kind of get together you can be sure there will be some form of tea served. An important element to making the perfect southern iced tea begin with the tea bags and allowing for a bit of steep time. Any southerner will argue that there is a certain brand that makes the best iced tea. I am not so much a brand snob when it comes to tea but I do agree certain brands are better than others for iced tea. What makes a good tea for one person may be completely different for someone else. Experiment until you find the right tea brand that suites you. Did you know that South Carolina was the first place in the United States where tea was grown and the only place where it was ever produced commercially? 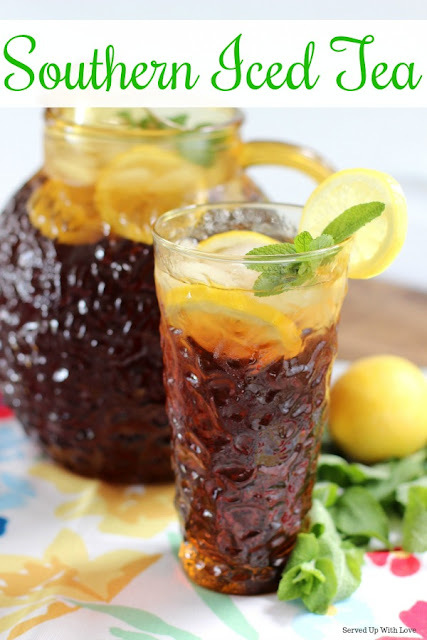 The oldest sweet tea recipe in print can be traced to a community cookbook published in 1879 titled “Housekeeping in Old Virginia” by Marion Cabell Tyree. One common complaint when it comes to making iced tea is the bitterness. Bitterness in tea is caused by overcooking and burning the tea leaves. Tea should never be boiled in the pan, you want the water to warm just before a simmer and then let the tea steep in the warm water. To counter the bitterness, add a pinch of baking soda, about 1/8 of a teaspoon into the hot, steeped tea after you remove the bags. It will not affect the taste of your tea, and will provide insurance against the bitterness. 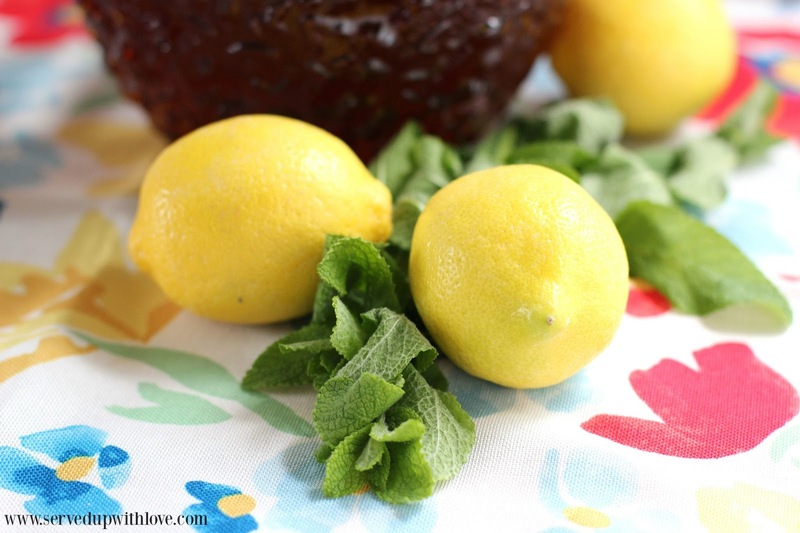 Want to fancy up your glass, serve your southern iced tea with lemon wedges and sprigs of mint. One sip and I bet you will instantly transport to a time with your Grandma on the front porch swing laughing and having the time of your life. One thing is for certain, making the perfect southern iced tea comes down to your own preference. Many generations in my family have passed down the love of iced tea. We may not technically make the perfect southern iced tea by steeping versus boiling and such, but we do make it to the liking of our family. If you put your heart and love into something, it is felt by all those that enjoy it and that to me is perfection. In a small saucepan fill with water and add the tea bags. Bring the water to just under a boil and turn off. Let it sit for about 5 minutes to steep. In a gallon pitcher, add 1/2 gallon of cold water and sugar. Remove the tea bags and add the baking soda and stir. Pour into the pitcher and continue to add water to fill the pitcher and stir. Chill in the fridge.